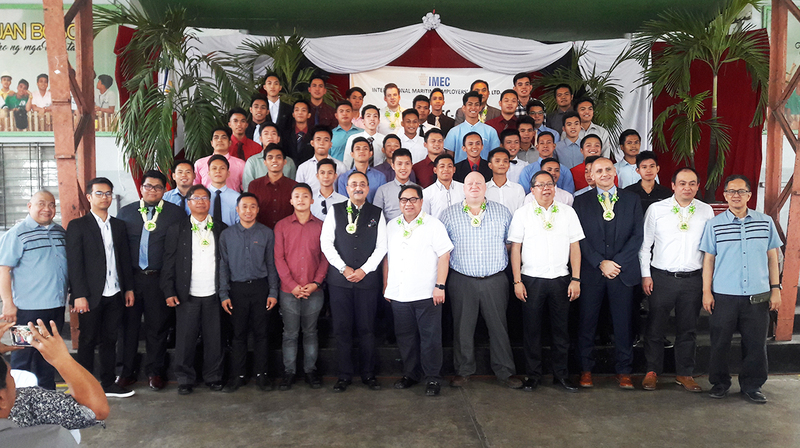 January 30, 2019 the International Maritime Employment Council (IMEC) presented and inaugurates the 46 trainees/students, 2nd batch of Engine Rating Program at Don Bosco TVET Center. Another Blessing and a golden opportunity to all our Fitter Machinist, full scholarship with monthly allowance, plus the additional training for seafarers and guaranteed employment as Engine Rating within the IMEC-affiliated fleet after their graduation. The inauguration was facilitated by Don Bosco TVET-Center officials headed by Bro. Jogar Villanueva and assisted by Fr. Gaudencio T. Carandang Jr.,SDB, Fr Manuel H. Nicola, SDB, Fr. Nesty Pidazo, SDB and some Lay Mission Partners. The activity was attended by, IMEC Chairman Capt. Rajesh Tandon, IMEC Head of Training and Operations Mr. Adam Lewis, IMEC Training Manager Mr. Dan Tolentino, AMOSUP/PTGWO/IGF President Doc. Conrad F. Oca, Crewing Managers of different shipping lines, Trainees and Parents.